Chop Chive and…Well? | Food It Yourself! Last year my mom gave me three little divisions from her chive plants. This spring I have three gigantic bundles of chive to contend with. One bundle I divided and moved to the main garden. The second, I divided and put into temporary pots for dispersion amongst friends and coworkers. The third I had no place for so in a desperate move to avoid waste I harvested the chives, stuck them in mason jars with a little water, and explored the internet for chive-related recipes. There on the world wide web I discovered chive pesto. 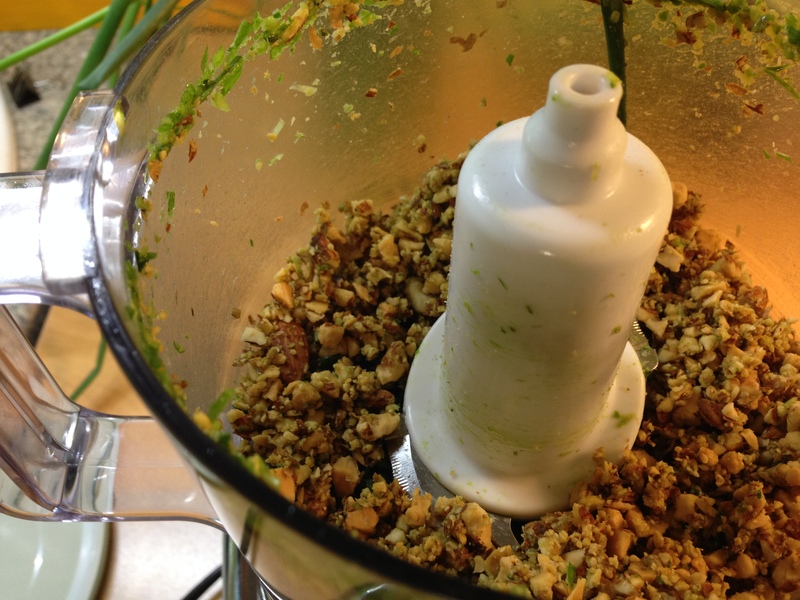 Usually, “pesto” indicates a paste of basil, pine nuts, hard cheese, and olive oil. However, the verb pesto actually invokes the traditional method of producing the condiment; it means “crush” or “pound”. 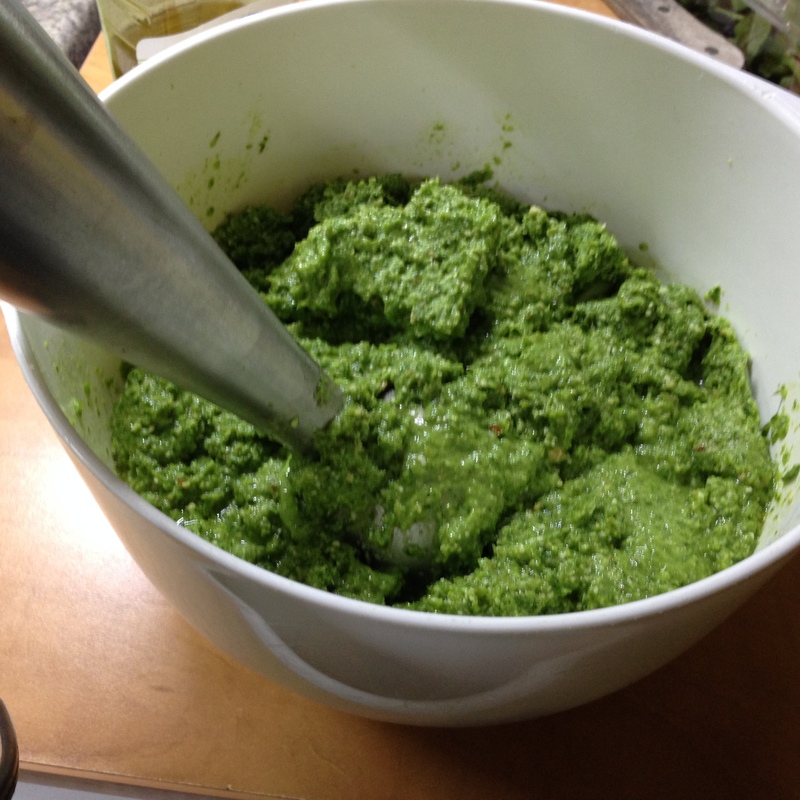 Any sauce made by squishing things in a mortar and pestle (see the connection) is a pesto. You can find a zillion recipes for non-basil pesto on the internet, and I found many for chive based pesto. Here are three. Here is a recipe from Spice Chronicles. The recipe looked really good, but I did not have blanched almonds or a Serrano chili. Splendid table offered this version, served atop pasta in typical pesto fashion. Alas, I had no pine nuts and my basil and mint are too small to harvest. Here is a recipe from A Garden for the House. 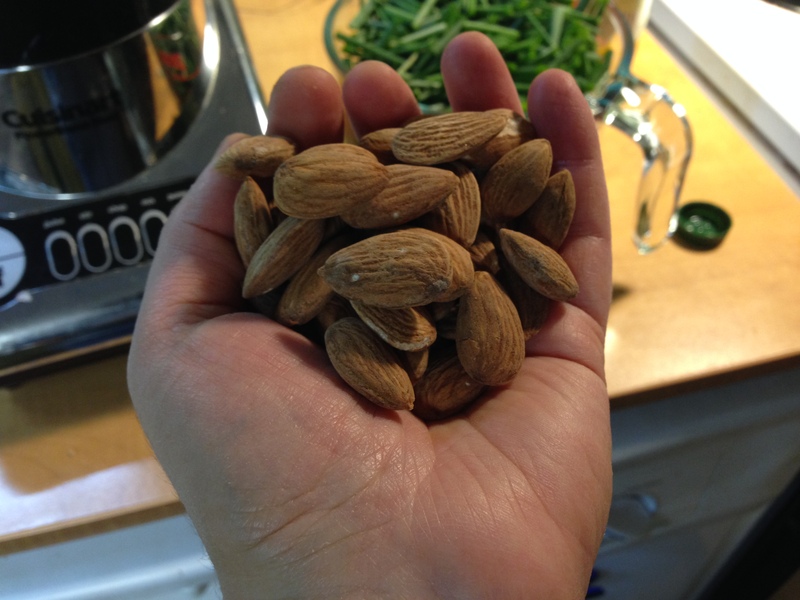 Again, no blanched slivered almonds to be had, here…. Wait a second- the only reason to use blanched almonds is a fear of the brown husks being visible in your food. You know what? Forget that bourgeois food silliness, the husk-on roasted almonds in my pantry are just fine. Along with my plethora of chives, Parmesan cheese, garlic, olive oil and lemon juice (I like a little lemon in my pesto) I forged ahead. I even went full proletarian and eyeballed my measurements. Okay, if you’ve ever read this blog before you know I habitually eyeball measurements. But you get the idea. I used my tiny food processor, so I had to go in batches. 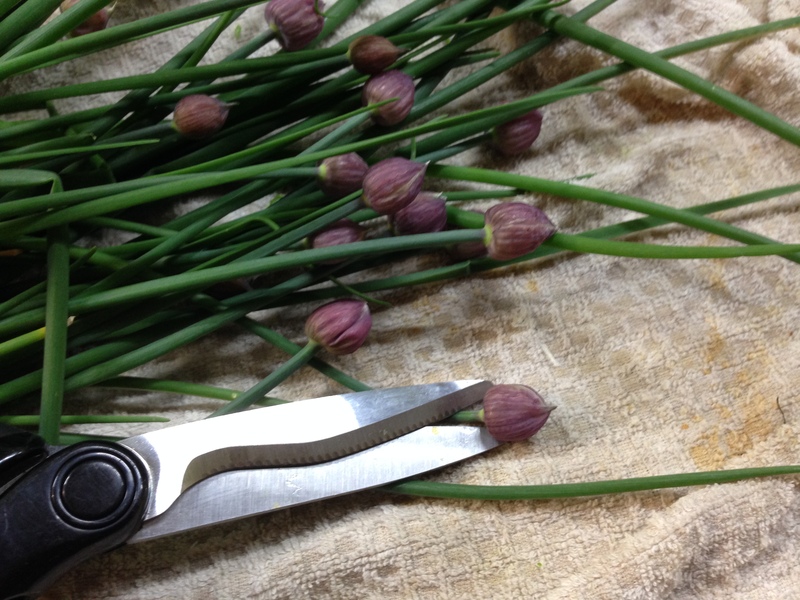 I snipped the chives with kitchen shears, which is way easier than using a knife. Each of the three bundles ended up being about 4 cups of snipped chives. Since I had to do several batches anyway, I added the garlic to one batch, the almonds to the next, and the cheese to the last. Each batch got a little oil, a little lemon and a little water to bring the paste together. I snipped the flower buds off the chives. The flowers are edible, but I feared they would complicate the flavor profile and possibly clog my dainty food processor. I roughly milled the almonds before adding the chives to this batch. I treated the Parmesan in a similar fashion. In the end, I mixed all the batches together and moved them to the refrigerator overnight. The flavors needed time to meld. The next day, Mr. Food It Yourself tried and I did a taste test. We agreed more olive oil was needed and I blended in another half cup or so with a fat pinch of salt and a dozen grinds of pepper. I used my hand blender to incorporate the extra oil. Hand blenders are great. Look how green and luscious that is! Are you disturbed by teeny flecks of almond husk in there? No you are not. Forget blanched nuts. Vive le proletariat! Yes, that sounds like a lot of oil but this is a big batch of pesto. A second taste showed marked improvement. Mr. Food It Yourself commented that it would be nice mixed with mayonnaise. 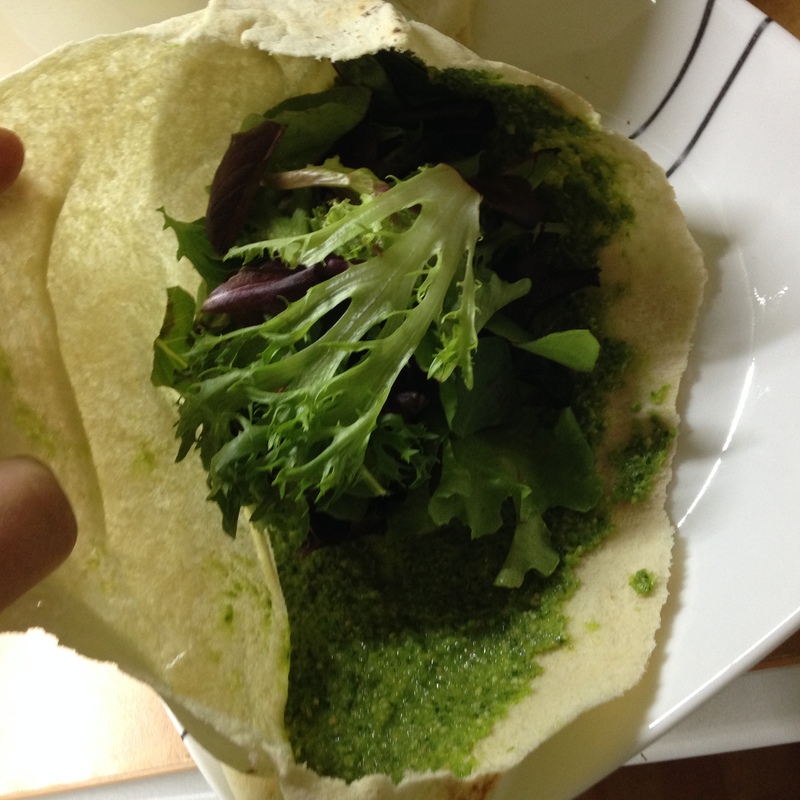 I spread some inside a pita and made a sandwich with spring greens. I filled a pint jar for the refrigerator, an 8-ounce jar for my parents who stopped by, and two bags for the freezer. Overall, this is a good condiment which I will be experimenting with in the near future. The salt level was just right, and the fresh garlic flavor was present but not overpowering of the chives grassy onioniness. However, Mr. Food It Yourself and I agree there is a missing background element to the flavor profile; neither of us can pinpoint what it is. I hope as we use the pesto in combination with other foods and seasonings we will figure it out. Also, we are open to suggestions for uses, so feel free to leave advice in the comments section.